Page Street Publishing, 9781624146077, 160pp. Take your love for hand lettering, coloring, and doodling to the next level with this easy guide to creating gorgeous sketches by hand. 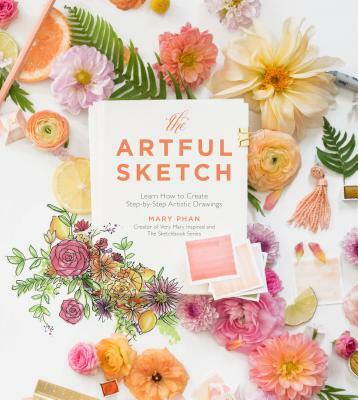 Artist Mary Phan has toured North America teaching luxury sketching workshops, and she now reveals her simple yet big-impact techniques for everyone— from beginners to experienced designers. You’ll learn to draw 14 exquisite sketches, featuring fully illustrated, detailed step-by-step instructions to ensure a frame-worthy result from your very first sketch! Follow along with Mary’s simple, foolproof sketching process: drawing in basic shapes with a pencil and ruler, bringing the scene to life with brightly colored art markers, and outlining with black ink for the final details. From each tutorial, you’ll have your own impressive work of art to share as a gift, send as a card, share on social media, use in your business, or display in your home. No matter how you use it, this book will give you the tools and inspiration to fill your life with more color, beauty, and creativity. MARY PHAN is an artist and the founder of Very Mary Inspired. As the creator of The Sketchbook Series, she has taught sketching workshops throughout North America. Mary has been featured in Utterly Engaged, The Knot, Style Me Pretty, Flutter Magazine, and many more publications. She lives in Northern California in the San Francisco Bay Area.